What is TB? How is it treated? Q: What is TB? How does it spread? How is it treated? A: Tuberculosis (TB) is caused by bacteria (Mycobacterium tuberculosis) that most often affect the lungs. Tuberculosis is curable and preventable. About one-third of the world's population has latent TB, which means people have been infected by TB bacteria but are not (yet) ill with disease and cannot transmit the disease. People infected with TB bacteria have a lifetime risk of falling ill with TB of 10%. However persons with compromised immune systems, such as people living with HIV, malnutrition or diabetes, or people who use tobacco, have a much higher risk of falling ill. When a person develops active TB (disease), the symptoms (cough, fever, night sweats, weight loss etc.) may be mild for many months. This can lead to delays in seeking care, and results in transmission of the bacteria to others. People ill with TB can infect up to 10-15 other people through close contact over the course of a year. Without proper treatment up to two thirds of people ill with TB will die. Since 2000 more than 49 million lives have been saved through effective diagnosis and treatment. Active, drug-sensitive TB disease is treated with a standard 6-month course of 4 antimicrobial drugs that are provided with information, supervision and support to the patient by a health worker or trained volunteer. The vast majority of TB cases can be cured when medicines are provided and taken properly. Please call 801-399-7250 if you have questions regarding the Tuberculosis (TB) Program. Monday, Tuesday, and Wednesday (except holidays). Clients must return 48 hours to 72 hours after testing to receive verification of test results. A positive TB skin test or TB blood test only tells that a person has been infected with TB bacteria. 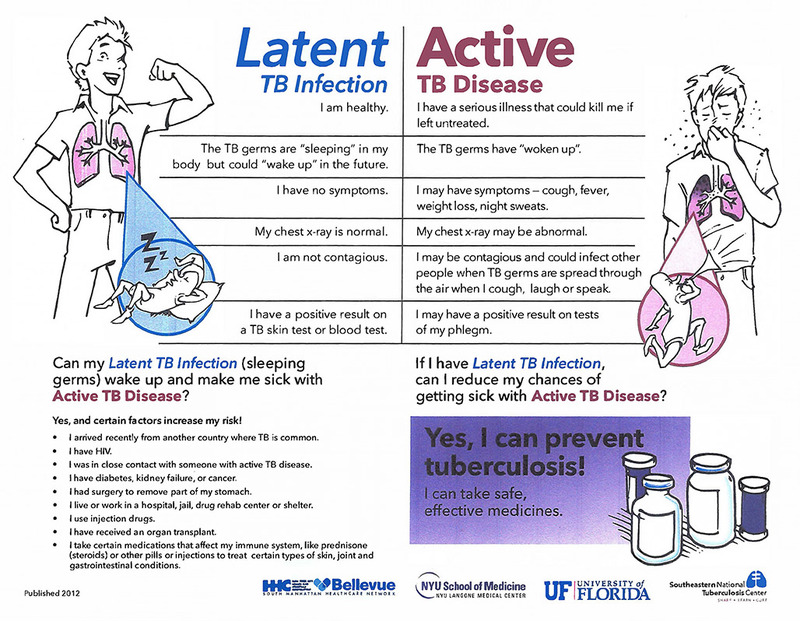 It does not tell whether the person has Latent TB infection (LTBI) or has progressed to Active TB disease. Other test such as a chest X-Ray, symptom review and possibly sputum samples are needed to assess whether the person has Active TB disease. If you have had a positive TB test previously, please call to talk with our nursing staff. You can also view the video about TB prevention titled You Can Prevent Tuberculosis for more details, which is a 7-minute video.